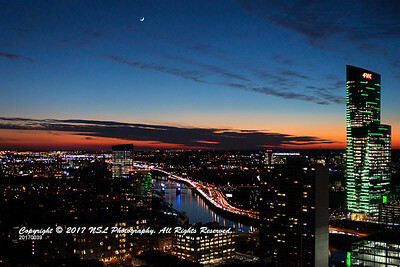 NSL Photography Blog: Capturing cityscapes "under glass"
• If permitted, use a tripod for low light conditions. They're very helpful for golden hours, dawn, dusk and night cityscapes. Unfortunately, many observation decks ban tripods, but permit smaller, less obtrusive support devices, such as table top tripods, like the GorillaPod, and beanbags like the Steadybag which I often use. Sometimes, the photographer must be the tripod. Find a pillar, post, wall or girder. Lean against it to help you hold your camera steady. Spread your legs as wide as your shoulders. Bring your elbows into the sides of your body. While looking through the viewfinder, press your camera against your forehead. Keep one hand under your camera body/lens and the other on the right side of your camera. • Carry a cloth in your bag, along with some lens cleaning solution to clean fingerprints and other dirt from the glass you'll be shooting through. • During daylight, try a polarizing filter to reduce or possibly eliminate problem reflections. At night, it won't be particularly useful as it reduces the amount of light passing through the lens. Polarizing filters are more effective when the source of the light reflected on the glass is from the side, perpendicular to the lens. It works poorly when the light comes from in front or behind your camera. If the observation deck's glass is tinted, the tinting may add some polarization qualities to the glass. If it does, skip using the filter, as it won't work properly. • Tinted glass will affect the color rendition of your images. To compensate, start by using auto white balance. Then experiment by adjusting your white balance settings until you find a good one or use a custom white balance setting. I stick with auto white balance, save my images in RAW format, then correct their color, if necessary, during post-processing. • Wear dark, not light colored clothing, to reduce your reflection on the deck's glass. • If you can control the lights at your location, such as in a hotel room, turn them off. Positioning yourself between the window and a blackout shade, if any, can also help eliminate reflections. • Don't use a flash. It doesn't have enough power to help and will only bounce off the glass back at your camera/lens, ruining your images. • Shoot as close to the glass as possible. Couple that with a large aperture to reduce your images' depth of field. Together that will minimize the effect of window glare and glass defects. • Below are three physical methods to reduce or eliminate reflections on the observation deck's glass which can show up in your images. For each, get as close to the glass as possible. º When permitted, I use a collapsible rubber lens hood on my lens, touching the glass, to eliminate reflections. It prevents you from scratching or damaging the glass. It even gives you limited freedom to adjust your camera angle while maintaining your lens hood flush to the glass. The hood's rubber material also won't pick up any glass vibration from the building or outside conditions. º If a rubber lens hood won't work, try a Lenskirt, a portable, flexible hood which attaches to your lens, plus attaches to the glass via suction cups. It folds flat in your bag. It gives you more freedom to adjust your camera angle to the glass. Beware that observation deck personnel may object to its size and being attached to the glass. º I've never been to an observation deck that permits blackout curtain setups because they block the view for others, however, if you're traveling with another person, they can assist you by holding a jacket or a large black cloth behind you and somewhat above your head to block out reflections. • You may also have to overcome glass induced distortion. If much of the glass at the observation deck is angled to your camera/lens, seek out glass perpendicular to your lens, if at all possible, and shoot through it. While glass enclosed observation decks offer photographers challenges, you can still make great cityscape images from them, if you follow the above tips. This is absolutely the best article on shooting cityscapes through glass windows that I've ever read. Great job. I've had problems with the Lenskirt. I've had to replace a couple of the suction cups in the last 6 months, but more than that, most of the time they won't let me use it. I didn't know about collapsible rubber lens hoods. What a great idea!!! I just ordered one at Adorama. Thanks. I learn so much here. I always get a kick out of people who are shooting landscapes and are using their flash even though the buildings in the scene are a quarter mile away or more, as if the flash can actually light them up. Crazy people. Like Justin, I just ordered a rubber lens hood which I'll keep in my kit at all times. Thanks. Ned, if the glass is tinted wouldn't the polarizing filter help me out. Here's the problem. This is going to be somewhat technical. There's no way to get around it. Normally, light shining from the sun is coming from varied directions and bouncing around before coming into your lens. When you put a polarizer in front of a lens it aligns the light which now comes in from a single direction. That's what the tinted glass does sometimes, to an extent. It's similar to tinted glass on tour buses. Now when you put another polarized filter in the mix, a polarizing filter on your lens, you get greatly reduced visibility from differently-polarized light (the alignment of light from the tinted window is out of alignment with the light aligned by the filter on the lens) and little effected visibility from like-polarized light. Since there are small, local areas of polarization, you end up with a spotted effect. You often see this effect when you're wearing polarized sunglasses while looking through a polarized tinted window. Hence, don't use a polarizing filter if the observation deck's windows already have polarized tinting. You'll get undesirable effects ruining your images. Great article. Thanks. What do you think. Which observation deck building should I go to in NYC? I'll be there for a visit next month. My favorite place to shoot cityscapes in NYC is the Top of the Rock. It's upper observation deck has no glass, so it's easy to shoot from and you get a wonderful view of Central Park. The best part about the Top of the Rock is you can take cityscapes that include NYC's two most iconic skyscrapers, the Empire State Building and One World Trade Center. If you're in one of those buildings, they won't be in your photos. That said, I also like going in One World Trade Center. Among other views you get a spectacular shot of Manhattan looking north. It's NYC's highest observation deck and definitely worth a visit. While at OWTC, don't forget to stop in at the 9/11 Museum and spend some time at the 9/11 memorial. Happy Holidays to you and all my readers. I've had mixed results with the Lenskirt. My first one died a quick death with the suction cups coming loose. My second one (got it free as an exchange from the seller) has held up. I never thought of the rubber lens hood. I just ordered one. It seems as though it will be easier to use. I was in the observation area of the Empire State Building last night and suggested to a person shooting out the window to turn off her flash, which I saw was ruining her photos taken with her iPhone. She told me to "Buzz off!" She turned the flash off anyway and got great photos she was showing off to her friend. She didn't thank me, of course.